Sugared walnuts can be a delicious addition to one's morning oatmeal. This is a food I have often enjoyed when eating from a breakfast buffet. The nuts add a healthful fat to balance out all those carbs in the cereal. And with the candied nuts, the oatmeal is made sweeter to taste. So I found a recipe online for sugared walnuts. It called for white sugar, but i prefer brown sugar, so that is what I used this morning. I put a handful of walnuts in a frying pan with some melted butter and two tablespoons of brown sugar. ....it turned into a disaster! The sugar wound up as a sticky blob that dried into a candy-like substance -- and it did NOT stick to the walnuts at all. I certainly did something wrong. I will have to find a better way. 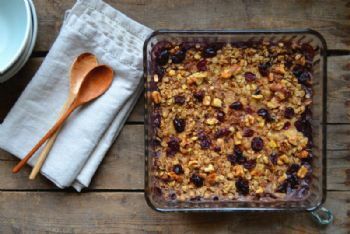 While looking for recipes online, I did run across this interesting recipe for baked oatmeal with walnuts (and fruit). The author suggests making it when we have company for breakfast. •	1/3 cup natural cane sugar or maple syrup, plus more maple syrup for serving if you like it sweet! 1. Preheat the oven to 375° with a rack in the top third of the oven. Oil the inside of an 8 inch square baking dish. 2. In a bowl, mix together oats, half the walnuts, sugar (if using as your sweetener), baking powder, cinnamon, and salt. 3. In another bowl, whisk together maple syrup (if using as your sweetener) milk, egg, oil, and vanilla. 4. Arrange the banana slices in a single layer in the bottom of the prepared baking dish. Sprinkle two-thirds of the berries over the bananas. Cover the fruit with the oat mixture. Slowly drizzle the milk mixture over the oats. Gently give the baking dish a couple taps on the countertop to make sure the milk moves through the oats. Scatter the remaining berries and remaining walnuts across the top. 5. Bake at 375° for 35 to 45 minutes, until the top is nicely golden and the oat mixture has set. 6. Remove from the oven and let cool for about 10 minutes. Cut into nine squares and serve in bowls. 7. This tastes great on its own but if you prefer, drizzle with maple syrup and pool some almond, soy, or dairy milk on the bottom. NOTE:When apricots are in season, try this dish with fresh apricots instead of bananas on the bottom of the baking dish. Out of this world. FOR VEGANS: To make this dish vegan, use non-dairy milk and substitute 1/2 mashed banana for the egg. I make it this way about half the time and it's delicious. Sounds tasty but way too much work for when I'm ravenous in the morning, I just stir 2Tbsps of natural crunchy peanut butter into the mix when I make my morning oatmeal. Love walnuts and banana in oatmeal! My husband, mom, and doctor all liked oatmeal but I don't care for cereal. I love walnuts or pecans in m oatmeal. LOVE apricots, raising (sparingly), blueberries and strawberries. Of course, bananas. I don't even add sugar when I use fruit in the oatmeal. I miss being able to eat oatmeal -- GI tract rebels too much, yet oatmeal triggers a cherished memory . As a child (1950's) my siblings and I took turns staying at our grandparents 50-acre farm, one grandchild at a time. Breakfast was a piping hot bowl of oatmeal cooked on a wood stove and topped with condensed milk.